As you can probably tell from my rating, this is one of the worst Trader Joe's purchases I've ever made. 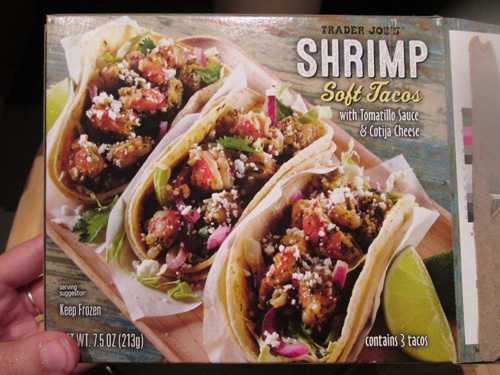 The only real way to make these frozen tacos is to microwave them, which should have been my first indication that these wouldn't be great (microwaving shrimp? yuck!). But I'm a huge fan of tacos, as well as a huge fan of shrimp, so I figured I'd give them a shot. I heated them up in the microwaved and was met with a truly unpleasant smell as they were cooking. I wouldn't really describe it as a fishy-smell or anything, but just a general bad food smell. It was actually noticeable enough that even my boyfriend pointed it out. At this point I should have abandoned these tacos to the trashcan, but I decided to soldier on. The texture of the shrimp was kind of rubbery, and there was barely any "salsa" or cheese that I could identify. It didn't taste awful, but it wasn't good. 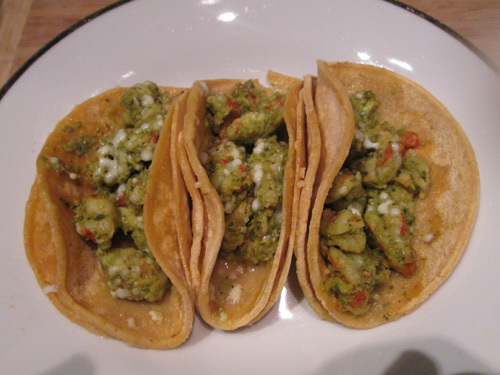 I thought maybe I could dress it up with some salsa, but after trying Green Dragon salsa, some tomatillo salsa from the fridge, Tabasco sauce, Valentina Hot Sauce, and Hatch Chile Salsa, I finally gave up on the idea that these were somehow salvageable and threw the last taco away. There are some times where I think that maybe something would be great for someone else and that they just weren't great for me, but I honestly don't think anyone–other than maybe someone who is actually starving–could possibly eat these and think that they were anything less than terrible. Just don't do it. If you want shrimp tacos, pick up a bag of fully-cooked shrimp, some soft tortillas, and a jar of salsa and make these yourself.